Changes in production processes reflect the technological advances permeat- ing our products and services. U. S. industry is modernizing and automating. In parallel, direct labor is fading as the primary cost driver while engineering and technology related cost elements loom ever larger. Traditional, labor-based ap- proaches to estimating costs are losing their relevance. 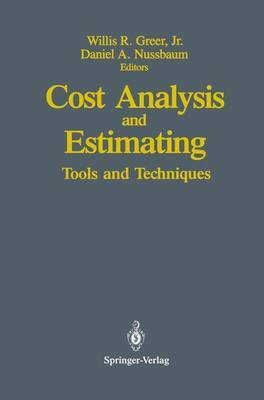 Old methods require aug- mentation with new estimating tools and techniques that capture the emerging environment. This volume represents one of many responses to this challenge by the cost analysis profession. The Institute of Cost Analysis (lCA) is dedicated to improving the effective- ness of cost and price analysis and enhancing the professional competence of its members. We encourage and promote exchange of research findings and appli- cations between the academic community and cost professionals in industry and government. The 1990 National Meeting in Los Angeles, jointly spo~sored by ICA and the National Estimating Society (NES), provides such a forum. Presen- tations will focus on new and improved tools and techniques of cost analysis. This volume is the second in a series. The first was produced in conjunction with the 1989 National Meeting of ICA/NES in Washington, D.C. The articles in this volume, all refereed, were selected from about 100 submitted for presen- tation at the Los Angeles meeting.